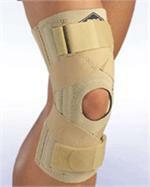 This sleeve provides a workable approach to the conservative treatment of patella subluxation. 1/4" thick neoprene for extra compression, lateral felt buttress next to the patella for added support. 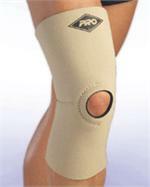 A channel around the patella opening on the inside of the sleeve holds a soft rubber stabilizer. Openings in this channel on the top, bottom and each side allow access to the stabilizer, any portion of which is easily removed with scissors. 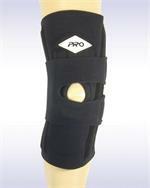 A four inch long rubber “bumper” enclosed in a neoprene pocket designed to place pressure on the infrapatella tendon. 2 1/2” wide and closed in the rear to form a “mini sleeve”. 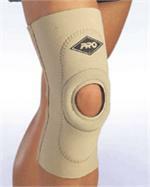 Ideal for Patella Tendonitis, Chondromalacia and Osgood Schlatter. 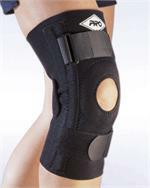 A soft four inch long rubber “bumper” enclosed in a neoprene pocket designed to place pressure on the infrapatella tendon. 1 3/4” wide and approx. 18" long with hook & loop to wrap securely. 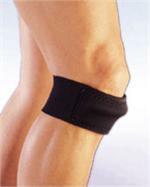 Ideal for Patella Tendonitis, Chondromalacia & Osgood Schlatter. A buttress of orthopedic felt in a horseshoe configuration is positioned underneath the sleeve, taking advantage of the compression of the sleeve over the buttress. 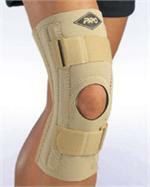 This assures proper positioning and control of patella movement. 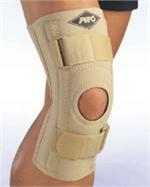 All the features of the Dr. “M” Patella Brace but with the felt horseshoe inverted in position. Effective in altering the mechanics of patella-femoral articulation when indicated in cases of Osgood Schlatter and Chondromalacia patella disorders. 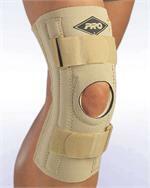 Same patented features as the Dr. “M” Patella Brace but with a moveable patella horseshoe. Hook-and-loop fasteners allow wearer to remove and replace horseshoe in desired configuration (inferior, superior, lateral, or medial). Unique three pull adjustment system allows the user to adjust the fit at the thigh, knee and calf. The center tab regulates pressure in the popliteal area no matter if they are sitting, standing or running. This adaptation of the Dr. “M” is designed to apply specific pressure over the lateral and medial menisci. Elastic “dogbone” straps attach above and below the patella opening over the felt horseshoe without interfering with normal patella tracking.